Coming home to an open door can lead to your worst nightmare. Get a deadbolt installed and keep your property and family safe with this cost-effective deal! High Security Characteristics – Make better decisions and choices with Locksmith Harlem. Key Control The ability to control the creation, distribution, and cutting of keys for a given lock can greatly increase the security of the keying system for a given lock. Most high security locks have key bows and warding patterns that are patent protected to prevent unauthorized manufacturing. Keys to high security locks also generally require a security card be presented for a locksmith to duplicate keys. Many also require a specialized key cutting machine. Manipulation Resistance Almost all high-security locks have components designed to resist manipulation from lockpicking and decoding attacks. Security pins are the most popular example of anti-manipulation components in pin-tumbler locks. Some locks also have components designed to resist impressioning and key bumping. Restrictive Keyways The use of complex and paracentric keyways frustrate attacks by manipulation by making it harder to insert and maneuver tools within the lock. Key Differs High security locks traditionally offer a very high number of real and theoretical key differs to prevent cross keying and allow for complex master keying configurations. 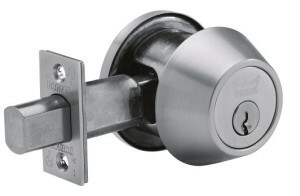 Destructive/Forced Entry Resistance All high-security locks use strong materials and designs that make them resistant to destructive entry techniques. Steel rods, ball bearings, and hardened materials are common. High Manufacturing Tolerances Increased concern over the tolerance of components to provide a manipulation-resistant and functional lock accompanies most high-security locks. Increased tolerances also help to increase the number of available component sizes or depths and promote longevity of the lock.